Tommy O'Hara (Blues 2014) has been selected First Team "All New England Region" NCAA, D3. Tommy is a Senior at Tufts University. CONGRATS ! The Norwood Blues swept through five games to capture the 2017 "Around The Horn" Tournament title. Pool games were won on Friday and Saturday with Jake Greenberg and Isaiah Rivera picking up the wins on the mound. Sunday began bracket play with a win in each game needed to advance to the next. In the quarter final round the Blues beat Wisconsin Elite 9-1 with George Sherman picking up the "W." In the second game of the day, Cameron Benesch was the pitcher of record in a 4-1 win over the Homestead Ranchers. 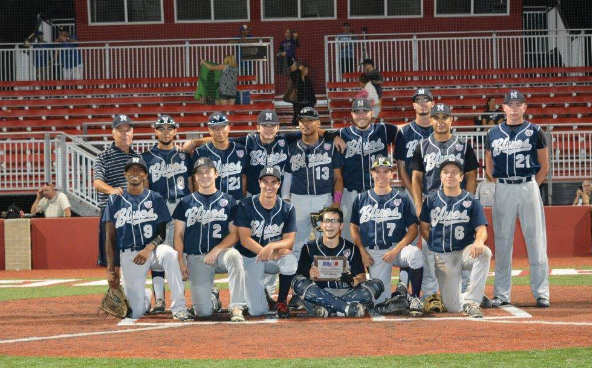 The title game matched the Blues against PBA DeMarini. Matt Willett was the winning pitcher in the 6-1 victory. Blues pitchers who also contributed to the week's success were Sam Kindle and Tom Kunzer. Contributing in the line up through out the tournament were Sam Nozicka, Kyle Mitter, Sam Margolis, Jeff Mustari. Jovanni Sanchez, John McHugh, Jack Linforth, Justin Mills, Japeth Bandi, Henry Singer, Jaime Sanchez, Tony Barreca and Isaiah Rivera. The BLUES conclude the 2017 summer season, year thirty one, with a final tally of 29 Wins, 9 Losses and Three Tournament Titles. CONGRATS TO ALL ! 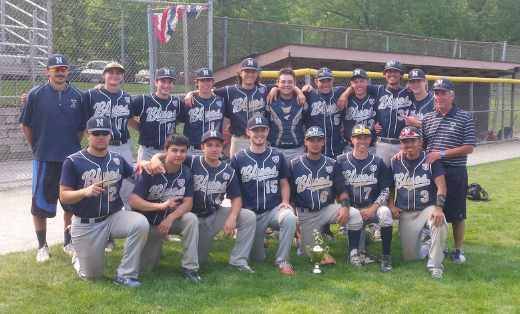 The Norwood Blues swept through the Tri State Classic with five consecutive wins including a come from behind extra inning title game victory over Beaver Dam, Wisconsin. The Blues won four games with out a loss in capturing the title at the 2017 Top Prospects Showcase. The semi-final and final games both saw complete games on the mound; George Sherman in the Semi-final win over Lombard Lightning and Cameron Benesch in the Title game win over the Lou Collier A's. Throughout the earlier stages of the tournament pitching was handled by Jake Greenberg, Isiah Rivera, Sam Margolis, Tom Kunzer, Sam Kindle and Matt Willett. 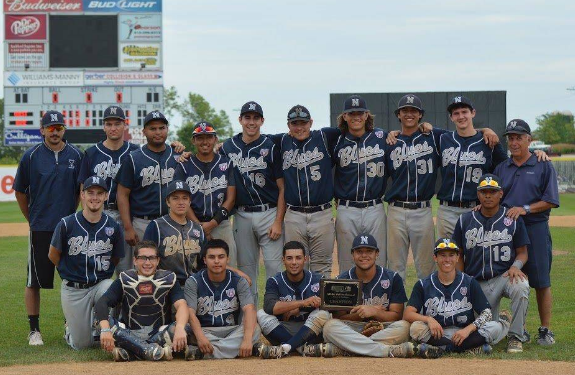 Position players who all contributed to the title included Henry Singer, Japeth Bandi, Justin Mills, John McHugh, Jeff Mustari, Kyle Mitter, Jovanni Sanchez, Jack Linforth, Jaime Sanchez, and Eddie Sweilem. Jake Goebbert (Blues 2005, 2006) was named "Big Ten Player Of The Week" for the fourth time in his three years at Northwestern. He was called up to the Padres major league roster this June and is currently hitting over .300. Jake has now signed with the Tampa Bay Rays for the 2016 season. Congrats and Best of luck JAKE ! The Blues 2016 summer season ended with a title game 4-1 "W" over the Marengo Scorpions for the "End Of Summer Classsic" tournament title. Tournament games were all played at Aviator Stadium in Loves Park, IL. The Blues earned the top prize bouncing back from a disappointing walk off loss a few hours earlier. In the title game, Jake Greenberg went the distance, limiting the then undefeated Scorpions to one run. Pitching chores were well handled earlier in the tourney by Ryan Miller and Noah Stern. Major contributors on the field and to the offense included; Eli Mercado, Jovanni Sanchez, Robert Vargas, Jaime Sanchez, Gianfranco Sorrentino, Kenny Serwa, Justin Cisneroz, Sam Reichert, Fred Fitte, Chris Huerta, Japheth Bandi, and Larry Wold. Great Finish CONGRATS ! 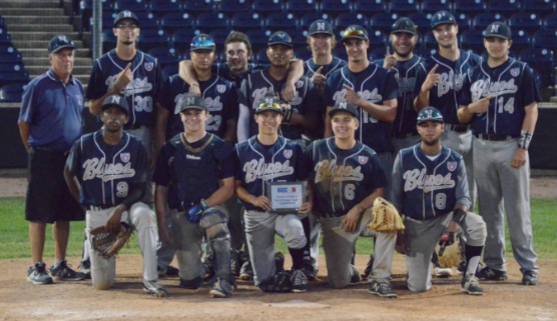 The Blues came away with the 2016 College Exposure Invite title with a 4-3 win over the Wisconsin Silver Sluggers in a game played at Carthage College. The Blues were a perfect 4-0 for the weekend. In a late Saturday night game the Blues faced an early 8-0 deficit which would have spelled elimination. The come back featured big hits up and down the lineup and a walk off base hit from Eli Mercado. Timely hitting came all weekend from the bats of Jovani Sanchez, Robert Vargas, Gianfranco Sorrentino, Trevor Heinlein, Chris Huerta, Sam Reichert, Justin Halpern, Justin Cisneroz, Japheth Bandi and Jaime Sanchez. On the mound, the major contributors to four wins were Noah Stern, Jake Greenberg and Fred Fitte. CONGRATS ! 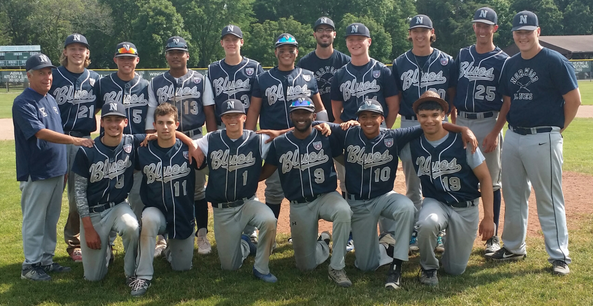 In their summer 2015 finale the Blues won five straight games to capture the Around The Horn Tournament title. In their opening pool games, played at the University of Wisconsin Parkside the starting and winning pitchers were Zach Kaloustian and Christian Ruiz. Both threw complete game shutouts. In the Quarter final game Jovanni Sanchez was the starter and pitcher of record with the "Save" going to Mitch Goll. The Semi final sterter and winner was Blake Kons with a complete game effort. Going to the mound in the Title Game was Kenny Serwa who got the "W" with help from Mitch Goll, who got the last four outs and his second Save in the tournament. Bracket games were all played at Carthage College. On the final day's Semi and Final round; Sam Reichert had three hits, two base on balls and two sacrifice hits, Kenny Serwa had two hits and two base on balls, Joe LaCivita had two hits, Drew Thomas had two hits, Chris Huerta had four hits and a base on balls, Paul Cappetta had a hit, two walks and mutiple stolen bases. The left side of the infield, Eli Mercado and Kevin Garcia played flawlessly. The two catchers; Angel Comas and Justin Halpern did a great job of handling the pitching staff all week. David Hochstadt hit the ball hard all week and Robert Vargas had several key hits earlier in the tournament. 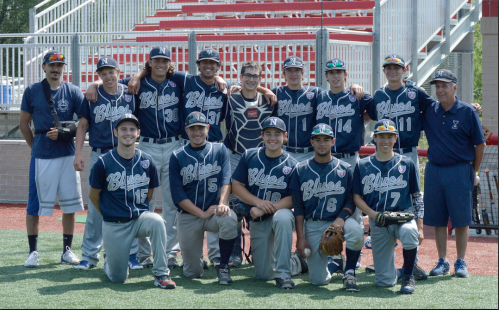 The Blues concluded the 2015 season with Six Tournament Titles and a record of 33 Wins, 5 Losses, and 1 Tie. 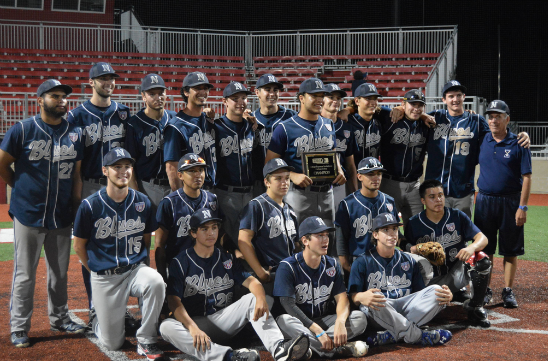 After an opening game loss, the Blues won five straight to walk away with the Fielders' Choice Wood Bat Tournament Title at Aviator Stadium in Loves Park. 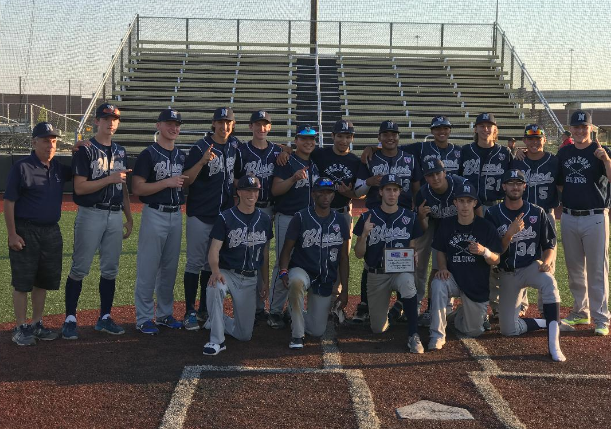 On the mound large contributions came from Jake Andrews, Jovanni Sanchez, Zach Kaloustian, Christian Ruiz, Blake Kons the starting and winning pitcher in the title game, an 11-4 win over Team Illinois, and Mitch Goll who earned a "Save" in the final. The Blues offense and defense depended upon contributions from Kevin Garcia, Eli Mercado, Robert Vargas, David Hochstadt, Chris Huerta, Austin Wills, Drew Thomas, Sam Reichert, Angel Comas, Justin Halpern, and Jovanni Sanchez. Joe LaCivita had a particularly outstanding tournament. In several games the Blues battled back from early deficits; earning a 5-4 win over Hard Knox after trailing 4-0 and in the final after trailing 3-1 and 4-2. 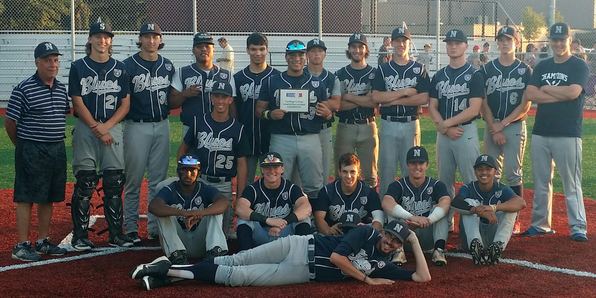 After a first game loss, the Blues proceeded to win four straight and walk away with the Tri State Classic title. Genoa City, who defeated Norwood in the opener, was the opponent in the title game. George Karavidas was the winning pitcher in the complete game effort. The wins on the mound in pool play were credited to Chris Ruiz and Jake Andrews, who threw a complete game two hit shutout in a 2-0 win over the host Watertown team. The winner on the mound in the semi final was Zach Kaloustian with a complete game win over Milwaukee RBI. Game three in pool play saw a bottom of the 7th, walkoff base hit credited to Ken Serwa which allowed the Blues to advance to the semi final round. Also conributing to the offense all week were Drew Thomas, Austin Wills, Joe LaCivita, Paul Cappetta, Robert Vargas, Chris Huerta, Justin Halpern, Andy Hayes , Sam Reichert, David Hochstadt and George Karavidas. Blake Kons was the Blues opening game starter on the mound and Kevin Garcia's middle infield glove work was outstanding all week. GREAT JOB ! The Blues bounced back from a first game 1-0 loss to win four straight and the 2015 "Top Prospect Invitational" played at Carthage College. Wins on the mound went to Kenny Serwa, Jake Andrews, George Karavidas and Blake Kons in the title game. In game two against Milwaukee RBI, the Blues scored two in the bottom of the 7th for a "walk off" 5-4 come from behind win. Kenny Serwa's home run tied the game and Kevin Garcia's double drove in the winning run. The Blues then defeated the Lakeside Cardinals 7-4 In the semi final the Blues defeated the Madison Sluggers 11-3 and in the title game shut out the Prairie Ridge Wolves 5-0. 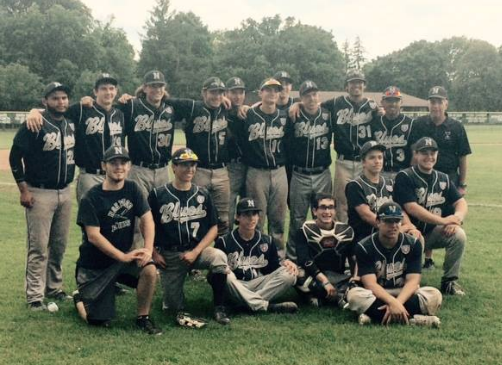 Multiple hits in the final were notched by Sam Reichert, Chris Huerta and Joe LaCivita. LaCivita's hits included a double and home run. Also contributing greatly on the final day were Austin Wills, Eli Mercado, Paul Cappetta ,Justin Halpern, Andy Hayes and Michael Jahnke. The Summer Slugfest saw the Blues win their first two games and then run into a weather shortened tournament. The Blues prevailed over the Longshots by a score of 4-2 and Kane County 6-2. Friday's game and Sunday's games were the victims of weather related cancellations. 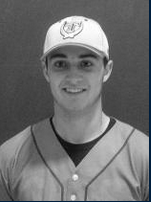 Jake Romano (Blues 2010,2011,2012) was selected Mid America Conference Pre-Season "Freshman of the Year". He has now at the close of the season been chosen "MAC Freshman of the Year" Jake , a three year Blues player, is now a Junior outfielder at Miami of Ohio and was chosen to the MAC "ALL Defense Team" having played the entire season without an error. His offensive numbers were: BA .296, OPS .826, Runs 44. Great Work Jake !